The B.C.-based Ledcor Group, which is well known as one of North America’s leading construction companies, is now in the sawmilling business, with a new multi-million dollar mill in Chilliwack, B.C., east of Vancouver. The Chilliwack mill processes low-end logs primarily from the B.C. Interior, manufacturing multi-dimensional cants, and lumber (Photo of new Ledcor mill by Paul MacDonald). Alberta’s quick response approach—along with forest companies putting a priority on harvesting areas infected with the mountain pine beetle—is working, and maintaining a high level of control of the beetle in the province. B.C.’s Shelley Stewart is kind of a pioneer in the forest industry; having started a successful log hauling operation that now has eight trucks, she’s helping break the gender barrier in the industry. The Council of Forest Industries (COFI) convention is Western Canada’s premiere forest products convention, and will be held on the shores of Lake Okanagan this year, in Kelowna, April 2-3. The convention promises to offer something for everyone, from top notch speakers to industry displays. 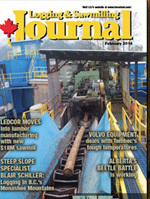 Ledcor Resources and Transportation has moved into producing solid wood products with a new $18 million sawmill in Chilliwack, B.C. that takes low-end logs and manufactures multi-dimensional cants, and lumber. A community forest in Terrace, B.C. is helping to support local sawmillers and add value to the productive forest, at the same time generating funds that are plowed back into the community. Logging contractor Blair Schiller is a veteran of steep slope logging, working in the Monashee Mountain Range around Revelstoke, B.C. using a variety of equipment including a used Washington 88 grapple yarder which—after a bit of work in Schiller’s shop—is earning its keep. Tembec’s Cochrane sawmill operation had a wide choice when it came to choosing a new wheel loader, and in opting for a Volvo L120G machine they have a piece of equipment that is delivering reliability in the polar vortex-type temperatures of northern Ontario. Having taken over the family logging firm from their father, Dave and Kevin Roberts have now ramped up their harvesting activities—and their equipment line-up—to meet the needs of Canfor’s newly modernized mill in Elko, B.C. 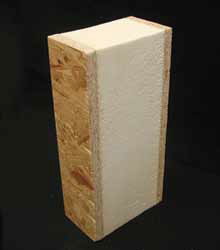 Research and testing is now being done to develop a technical guide to garner possible National Building Code of Canada (NBCC) acceptance for a composite building material called a structural insulated panel (SIP) consisting of a foam interior with oriented strandboard (OSB) as the only structural wood component around the exterior. One style of SIP has a foam interior with two OSB panels on each side for support. This work is being conducted over three years by Dr. Jon Makar at the National Research Council Canada (NRC), and is partially funded by Alberta Innovates Bio Solutions (AI Bio) through its Bioindustrial Research and Innovation program. The program supports research on new green building products. SIPs are a factory-produced, alternative building material suitable for the floor, wall and roof assemblies of buildings. While some SIPs have studs on their sides, the ones in this project are solely supported by the OSB facer panels. According to Natural Resources Canada studies, SIPs offer up to 50 per cent energy savings compared to conventional construction. Because the panels are manufactured in a plant, there is less on site waste generated during building construction, Additionally, manufacturers can speed up production of these SIPs because there are no studs being used, the SIPs are lighter, and on-site assembly takes less time requiring less skilled labor than traditional frame construction. Before being tested for compliance with the NBCC, a technical guide needs to be developed for this SIP design for the Canadian Construction Materials Centre (CCMC), which is part of NRC. Its mandate is to evaluate construction products for NBCC compliance for all Canadian provinces. Because of its construction design, acceptance of this SIP model within the NBCC could significantly benefit Alberta’s oriented strandboard (OSB) industry. Not only will it encourage more widespread SIP use in Canada, but SIP use in the United States is dominated by designs with no solid wood studs within their core. Manufacturers and suppliers for this product have wanted to develop this technical guide since the mid-1990s, says Dr. Makar, but unlike evaluations of other building materials, developing the guide is complicated and requires significant financial support. The technical work is now underway with financial backing from AI Bio, six SIP manufacturers, polystyrene and polyurethane foam manufacturers, an adhesive manufacturer, and two OSB suppliers, one being Ainsworth Engineered LLP. Ainsworth operates two, large oriented strandboard facilities in Alberta. “When you look at these panels, you are doubling the use of OSB per square foot of wall because you have it on the inside and outside of the panel,” says Makar. “So as use grows, there is potential to grow the OSB market.” It also creates a market for a different type of OSB, as the OSB material used in SIP construction is specially engineered for this use. Ken Lau, Director of Technical Services at Ainsworth Engineered Canada LP, says the company’s main motivation for supporting this research is to promote innovation and new use of OSB in building construction throughout North America. In gaining potential acceptance within the NBCC, it could lead to more SIP usage in building construction, and thereby increase market share for the company. More stringent energy codes are also encouraging builders to investigate alternative building materials like SIPs, with their ability to produce more energy efficient buildings. In addition to preparing the guide, Dr. Makar’s research group will be pursuing opportunities for technology transfer related to the use of the panels by the construction industry. The project will be developing and releasing, in concert with industry, technical reports and documentation that can be used by different industry professionals. For more information about the SIP research program, contact Dr. Jonathan Makar at (613) 993-3797 or jon.makar@nrc-cnrc.gc.ca. The mechanical thinning of juvenile trees in high density softwood and hardwood stands represents an opportunity not only to enhance the productivity of managed stands, but also an opportunity for acquiring a new source of wood biomass, says the Canadian Wood Fibre Centre (CWFC). Lodgepole pine, 19 years post-thinning. “It has been tested and proven that mechanical strip thinning can enhance growth potential by knocking back the densities and enhancing the vigour of the stands, making them less vulnerable to environmental risks such as insects, disease and fire,” says Derek Sidders, Regional Coordinator and Program Manager for CWFC. He adds that by removing the juvenile trees, this also creates the potential to shorten the rotation for the remaining trees, so they can achieve merchantability and increase their product values sooner. This potential exists for numerous forest types in Canada when this silvicultural treatment is applied, says Sidders. The machines used in this application are units with front-mounted mulchers and chippers. Sidders says the new opportunity exists in the recovery of the biomass for direct bioenergy (heat and power) use, solid wood fuels such as wood pellets, pucks or logs, liquid fuels, or bio-products for landscape or site remediation. As part of its woody biomass for bioenergy and inventory programs—as well as its wood biomass supply chain optimization program—CWFC will be conducting research and developing studies over the next two seasons testing new applications related to mechanical thinning of juvenile trees to achieve two objectives. The first objective is to develop and demonstrate techniques that enhance stand vigour by reducing density and sustainability risk; the second is to recover biomass for other values that Sidders says “should basically offset the cost of the treatment”. Lodgepole pine strip thinning 1994 in 1976 wildfire area. Historically, there has been an issue related to wildfire or natural disturbance in Canada’s high density softwood forests, primarily with jackpine and lodgepole pine. 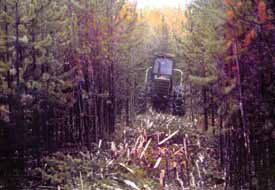 In the late 1980s and early 1990s, the Canadian Forest Service (CFS) and forest companies, in co-operation with provincial governments in the Prairie provinces as well as the Northwest Territories, investigated techniques such as mechanical thinning to reduce the cost of brush sawing using manual labor, to try to reduce the density of these stands. This also enhanced the vigour of these stands, and reduced their risk to fires and insect infestation. He says the next phase is to develop techniques to recover the biomass removed during this type of silviculture treatment and integrating it into the feedstock supply stream for bioenergy. 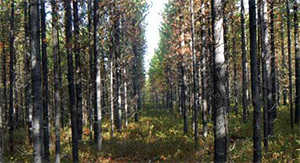 Prime target sites for this treatment method are any sites with reasonable access, originating from a wildfire or natural disturbance that is regenerating with very high density softwoods. For more information about this research program, contact Derek Sidders at (780) 435-7355 or Derek.Sidders@nrcan.gc.ca. Experts say that there will always be a market for people who simply want a log home versus a stick-built home. Given this demand, there may be opportunities for more Albertans to supply this market niche. Funding provided by Growing Forward 2 (GF2), a federal-provincial-territorial initiative, can help small-size woodlot value-added businesses to investigate this option. "A lot of people I meet in rural Alberta have questions about opportunities in log homes," says Toso Bozic, Agroforester with Alberta Agriculture and Rural Development. "Managing and operating a log home enterprise requires extensive knowledge, not just related to log properties and structural design, having a good quality log supply, and having the technical skills to construct a log home. You must also be knowledgeable about other technical aspects of log home building, such as understanding building codes." Bozic says that's where the GF2 funding initiative can help existing or start-up agri-processing and value adding businesses, to explore potential market feasibility and to answer critical questions related to log home businesses. Notwithstanding expected building code changes, Bozic says given Alberta's forest resource—which has the logs to supply this industry—it could represent a niche business opportunity for those willing to educate themselves about the type of logs needed by this industry. They can prepare for building code changes with appropriate home designs not only to supply the domestic market, but also potentially the export market. Currently, most of the log homes built in Canada are either sold in the U.S. or Canada. It is relatively unknown what the international market demand is or what the challenges are to tap into the international market for log homes. Bozic says a very important consideration when first starting out is where to learn the trade of log home building. While there are schools offering introductory skills training, experts say the best form of advanced log home building training is with an established log home builder. That's where the owner of Cowboy Country Log Homes in Turner Valley, Anthony Hodson, learned the trade. He worked with his father in log home building construction. The company builds handcrafted log homes, log furniture like picnic tables, and also refinishes log homes. Hodson says that among the challenges a new Alberta log home builder may face is competition from log home builders from neighboring B.C., finding workers, and also finding the right type of logs. He says that the province could help the industry by developing some type of exchange where log home builders could connect with potential sources of logs, either from forestry companies or from private woodlot owners. 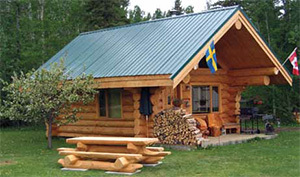 A typical log home is constructed with premium logs measuring 14" to 16" in diameter. Industry experts say a log home costs approximately 30 to 50 per cent more than building a similar stick-built home. Hodson agrees that people who choose to build a log home tend to do so because it is a lifestyle choice. "People that want them know what they are going to cost and that's usually not the issue," he says. "Owning a log home is different and off the beaten track from all the other houses out there and I think it reminds many people about the days when they had a country cabin out by the lake when they were kids." The challenge is to find this target audience and, again, this is where GF2 can help with market research of how to supply this industry. Under the GF2 Business Opportunity Program, successful applicants are eligible for reimbursement of between 50 per cent and 75 per cent of certain non-capital costs related to researching and planning a new business venture. Also under the GF2 Business Management Skills Development Program, successful applicants are eligible for reimbursement for 75 per cent of eligible costs for approved business skills development training courses. A log building constructed by Cowboy Country Log Homes in Turner Valley, Alberta. For more information about the GF2 program, visit http://www.growingforward.alberta.ca, or contact Toso Bozic at toso.bozic@gov.ab.ca.